If you didn’t have plans for the Bank Holiday weekend, you do now! 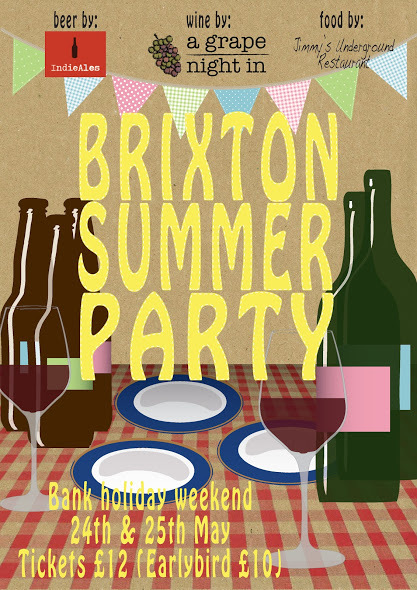 With this wonderful weather it seems the perfect time to announce a Summer Bank Holiday party! A Grape Night In will be joining us for a residency at Cornercopia with #WineWednesdays starting from 4th June. To toast their residency they will kicking off with a Brixton Summer Party. Come and celebrate a prelude to their summer pop-up by enjoying some favourite aspects of the summer season as they host a weekend of interesting beers, seasonal snacks and wonderful wines. With special guests Indie Ales, and Jimmy’s Underground Restaurant, this is a party not to be missed! Reserve you place by booking a timed ticket below from Edible Experiences – THE FIRST 60 TICKETS SOLD ARE ONLY £10!!! (Once these are sold standard tickets will be £12 ea) Your ticket/reservation includes an uber-summery cocktail on arrival, and little nibble from Jimmy’s Underground Restaurant, and a special discount code for tickets to the Summer #WineWednesday residency.